For LCW’s 2018 Christmas collection, we asked LCP staff members something that would be really special to give to LCP members. Their response was somewhat shocking! We would have never thought to collect cans of SPAM. After collection efforts by many of our Board of Directors and Advisory Council members, headed up by Ann Crittenden, we collected and shipped 2,406 cans of SPAM to LCP for Christmas. 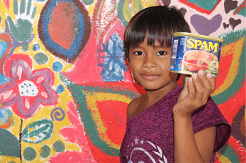 A can of luncheon meat may not seem like much, but to a family in Dumaguete City, Philippines, it is a once in a lifetime meal. 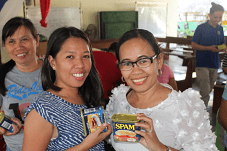 SPAM has grown in popularity in the Philippines, but it is very expensive for LCP members. Many had never tasted SPAM before, but they were excited to try it! Crowds pushed and shoved into lines after the Christmas service so every mother could collect two cans of SPAM. No one wanted to miss out on this awesome gift! Many said they would eat one can today and then save the other for Christmas Day or New Years Day. Others, planned to enjoy both cans with their families for a nice Sunday lunch. Overall, SPAM for Christmas was a huge hit! Thank you to everyone who organized collection efforts in their civic groups and churches, and thank you to everyone who donated cans or money for cans or shipping. We look forward to collecting cans of SPAM again for Christmas 2019! 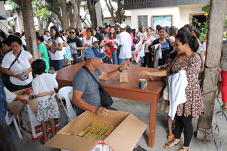 Read another article about Christmas at LCP.